Comment: Massive colour-changer from Sri Lanka; cornflower blue at day crossing over to lavender purple at night. Fine crystal, never dark, no visible inclusions, no window, no treatments. The master re-cut by Conny Forsberg (from a 4.60 carat gem) closed a small window and maximized lustre. 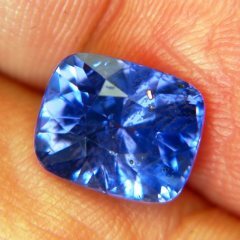 This type of colour change in Sapphire is always mild and smooth (not harsh as we find in alexandrite or green-purple Sapphire). To show the two colours mixing, we must use a torch together with daylight (under 'more images') which looks forced but is very close to the mix the eye perceived just without the hard shadows and inner reflections. The 'night-only' images are shot simply under normal tungsten in-doors light which brings out the full night colour best (actually candles do even better). New certificate free of charge on demand. Even if you don't have 30k handy, enjoy the magic colour transition under 'more images. 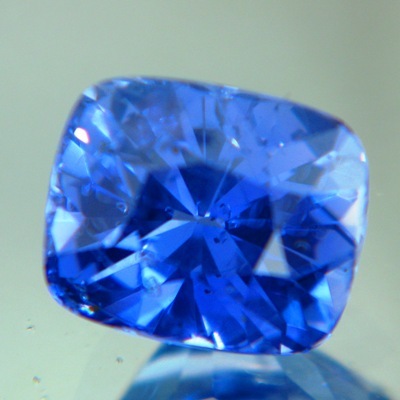 Significant size and finest quality in certified unheated Sapphire.